Can a building seem the Sun? 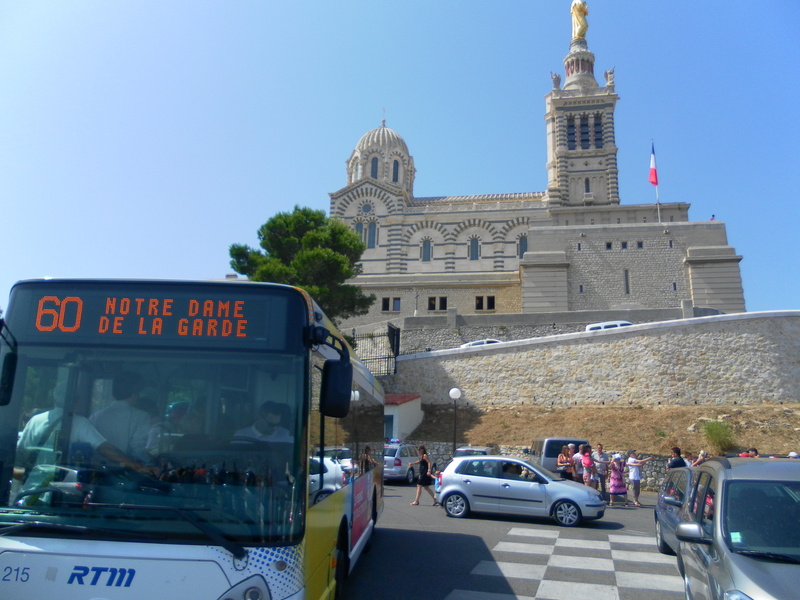 I arrive in the Provencal city at 6.30 a.m., rested but still eager to rest on my couchette. On the night train from Luxembourg to Marseille, the 11 hours in have been passed in a flash. As is routine, after the visit of 9 cities in 2 weeks, I search for a map from the information desk at the station, in order to search the city center. The sun is still low and it is rising over the sea. I am charmed watching it while I’m having breakfast, sitting in front of a little bakery. The little square is on a slope and the tables each have 2 longer legs, so that they can stand up straight. A coffee and a huge soft Nutella sandwich put me back on track. The light making its way between the houses gives me new energy and desire to walk in this city. 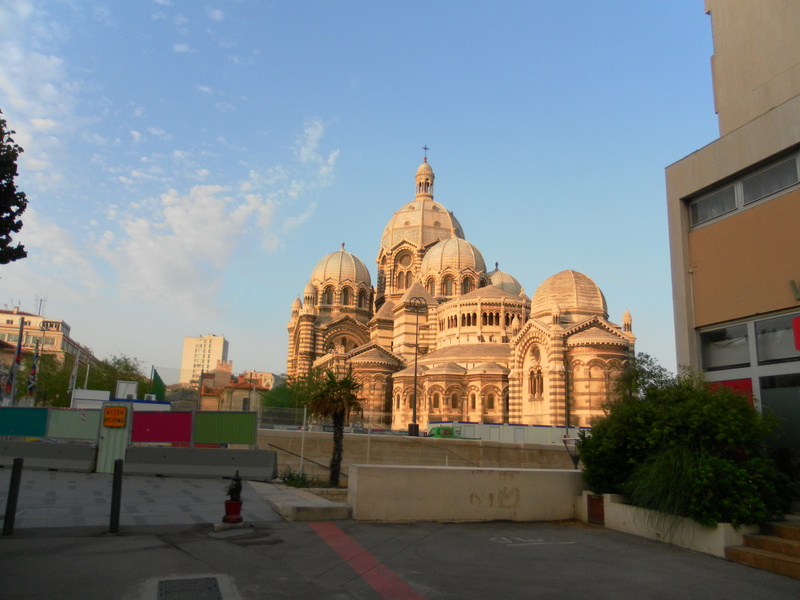 I enter in the cathedral and I stop in front of the tomb of Saint Eugene. I remember the group picture taken 7 years ago here in this chapel, during my travel to Lourdes. It seems like yesterday. 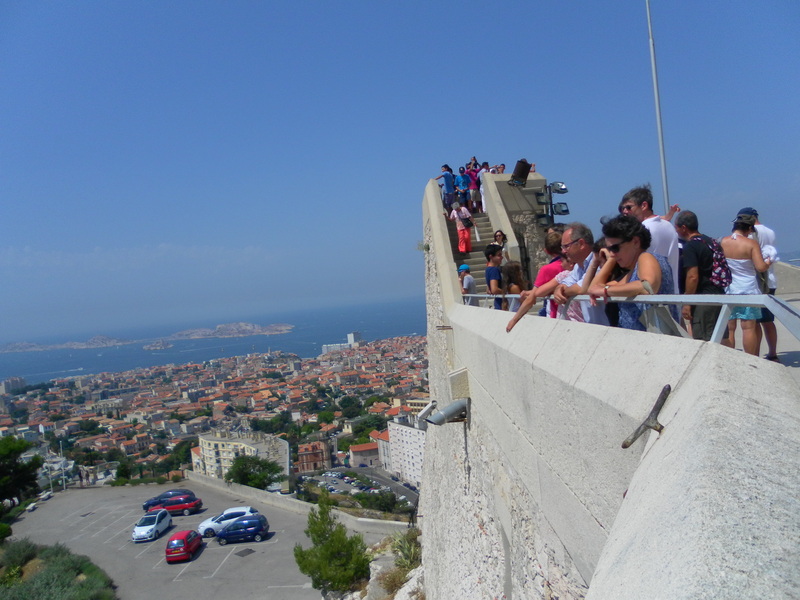 I read that at 12pm there is a mass at NotreNotre Dame de la Garde, the church which, from the top of the hill, oversees through Mary’s eyes the city and the sailors who arrive here. I find a bus and I arrive exactly at 12pm. At the end of the mass the priest says goodbye to everyone giving his hand to each person: seeing me with my backpack he says a surprised “oh-oooo” and he smiles. On the big terrace the Sun is scorching: after taking some photos I sit in the shadow of the sanctuary, near to a fountain. I eat a snack and I close my eyes enjoying the light breeze which is coming from the sea. A couple is speaking in Spanish. They are asking to themselves if the water is safe to drink. I look up and I say yes. They ask me about me: a new occasion to share a piece of life has been opened. I come back to the center and I find a tourist office with free wifi. I connect my Blackberry and I check to see if Giacomo wrote anything: he will arrive soon by plane and we’ll leave together for 2 more weeks of travel by train. 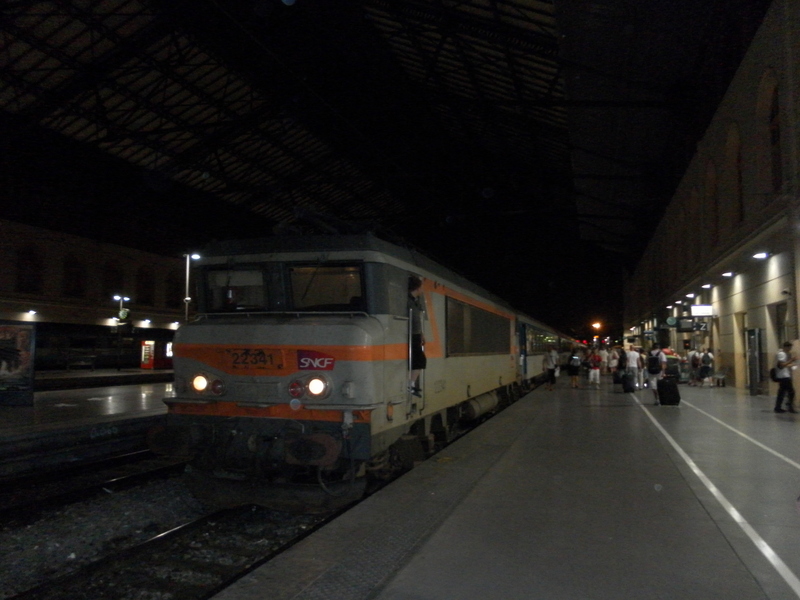 Another night train to San Sebastiàn is waiting for me and tonight the hours of travels will be 13. I wait for Giacomo in the bus station. He descends from the Shuttle smiling as always, ready to share with me this adventure between Spain and Portugal. A sandwich, a ride on a strange pedal charger – to give life to the mobile phone -and we go to the train. We don’t have couchettes tonight: the wagon with reclining seats seems like a cattle truck. We are closer than on a city bus, it’s hot, somebody snores and a lot of others smell bad. The alarms ringing all the time and the stops of the train make us not sleep. Sometimes trains are uncomfortable, but in the first part of my travel I found out that sometimes they can surprise us and it remains one of the best way to travel. Questa voce è stata pubblicata il 27 ottobre 2014 da andreacuminatto in ARTICLES IN ENGLISH, Travels con tag 1, 2007, 30, 7, backpack, Blackberry, couchette, Couchsurfing, days, dinner, Europe, Florence, fountain, France, freedom, inter rail, intercultural, InterRail, Irùn, Italy, language, languages, liberty, Luxembourg, map, Marseille, night, Notre Dame de la Garde, one, port, Portugal, Provence, railway, San Sebastiàn, sea, Spain, train, travel.